OPI 2000 won the rights to stage EBU middleweight champ Maksim Bursak´s mandatory defence of the title against Domenico Spada at today´s purse bids in Rome. OPI 2000 bid 42,317,00 EUR while K 2 Ukraine finished second with a bid for 41,146,00 EUR. Date and site is to be announced. Bursak is 28-1-1 and won the EBU title early 2013. Spada is 28-4 and have been near the top in Europe for some time now but always lost the make or break fights. Heavyweight Francesco Pianeta, 28-1-1, returns to action December 6 at the Brandenburg Hall in Frankfurt / Oder and take on Robert Teuber, 8-0, with the International German title at stake - the BDB version that is. In supporting bouts on this SES promotion is WBO and WBFed female middleweight champ Christina Hammer who defends the title against Mexican Carmen Garcia and WBO, WIBF and WBFed superlight female ruler Ramona Kuehne who takes an opponent to be announced. Tuffing Sport tries to revive professional boxing in Stockholm (Sweden) and stage a clubshow at well known dance hall / night club Gota Kallare December 14. Female jr middle Mikaela Lauren headline a five fight bill against an opponent to be announced. Peter Semo, Akilles Adnan, Benjamin Kalinovic and Redouane Kaye make up the rest of the bill. IBO Int´l lightheavy title. Codrington floored in the sixth and it was stopped when Codrington got back on his feet. Romero was down in the third and fifth. vacant Polish middleweight title, scored 99-91, 98-92 and 99-93. Dabrowski was hurt late in the first and took a standing eight count. Nozadze retired with a claimed injured hand early round 2. French 154 lb title, scored 97-93 twice and 98-92. WBFed 97-93 twice and 95-95. UBO Int´l title, 100-90 twice and 99-91. 38-37 twice for Ismaeeli, who was down in the second and 39-37 for Halas, who was too passive after the knockdown and blew it by just waiting. Ismaeeli was passive too after the knockdown but at least came forward and that won the fight for him. Granat wore down his flabby opponent with a steady body attack and Kowoll went down after a left hook to the liver. As he got up his cornerman waved with the towel and it was stopped. 40-37 twice and 40-36. 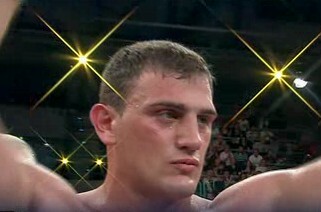 Malek came to survive and did that in good fashion while Ismailov showed good handspeed and variety in his boxing. 40-36, 39-38, and 39-37. Good fight between two Muay Thai stars. Zeljan was hurt by a right and took a s8ce moments later, was hurt some in the second and it was stopped. prodebut for both, Fornling bulldozed Puskas and the towel came in. Puskas said to have had 40-50 amateur fights but you could have fooled me. Lancia retained the Italian lightweight title on scores of 97-93, 97-94 and 96-94. 4x3: Henri Kekalainen, 73,8, Fin, debut TKO 1 (1.16) Andrejs Volincuks, ?